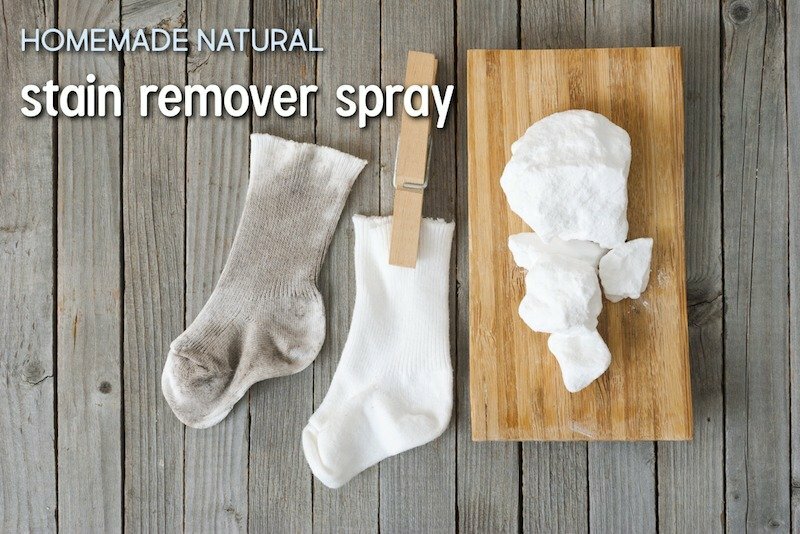 DIY Natural Homemade Stain Remover Spray that Actually Works! It sounds a bit dramatic, but I mean it when I say that my life changed when I discovered natural, homemade cleaning products. All of a sudden, our bodies and our budget got a break from all the crud that was weighing us down from store bought, chemical-laden cleaning products. Our closet was packed with a wide variety of different cleaning products, and it was breaking the bank. 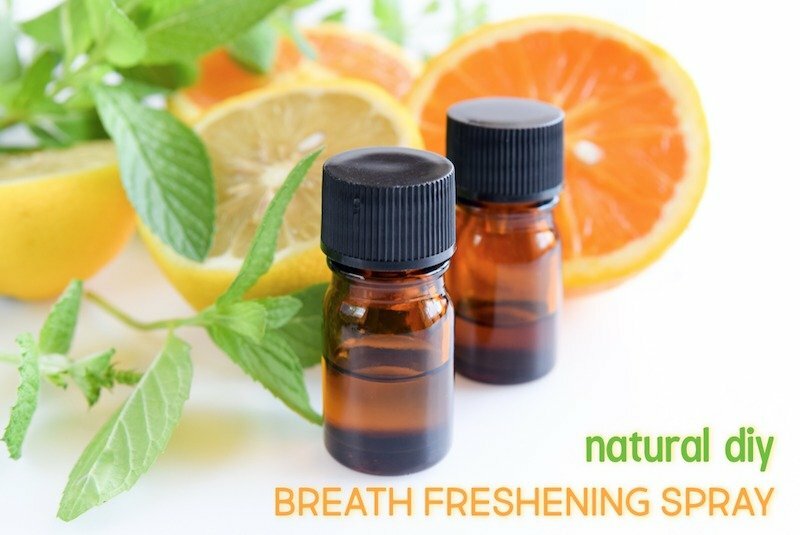 Now, our closet is a lot roomier, with only a few of my homemade cleaning products like glass and stainless steel cleaner, laundry detergent, dish soap, all purpose cleaner, and this DIY natural homemade stain remover spray. As a mom, stains are a part of daily life. There are spills, grass stains, accidents, and splatters that can seem to cover every piece of clothing in our house. Without a hefty stain remover, we would spend a fortune on replacing clothes and other linens. But I stay away from bleach (here’s a natural alternative) and other chemical-based spot stain treatments; so I needed to find another natural solution. 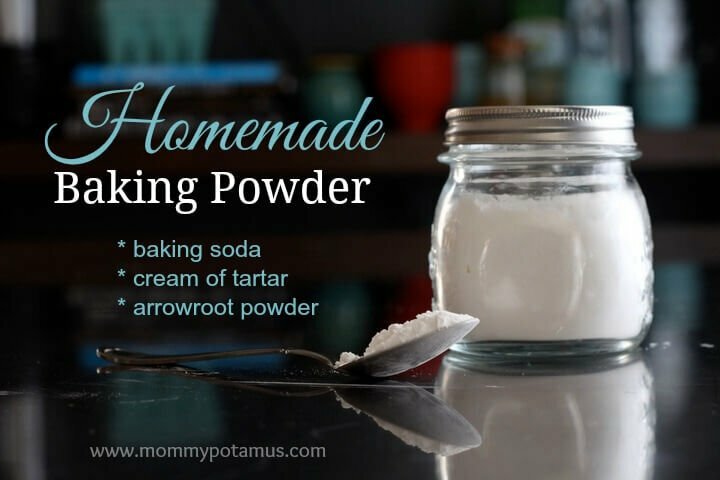 After several trials, I finally found a homemade stain remover spray recipe that works amazingly well. I’ve tested pen, coffee, ketchup, and grass stains on white garments with this spray, and it’s removed each stain effectively. 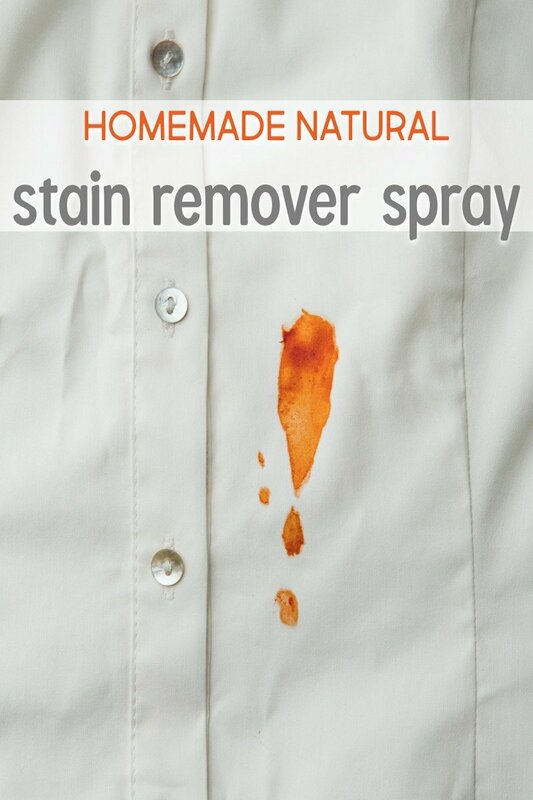 I have tested this stain remover on several pieces of colored clothing with success and without altering the color of the garment. But it’s always best to test the stain remover on a conspicuous area of the garment to ensure no discoloration takes place. I can’t wait for you to see how well this homemade stain remover works. This recipe makes about a cup of stain remover. You’ll want to use each batch quickly, so it’s best to make it in small amounts. Fortunately, this recipe is super easy to put together, so I just make a fresh batch each week when I treat all the stained laundry in the house. Combine all the ingredients in a dark spray bottle and shake to combine. Blot a liquid stain with a paper towel or another cloth to remove any excess substance. Shake spray bottle before each use. Spray stain remover directly on the stain. Let rest for 5 minutes. Scrub or wipe the stain from both sides of the garment until the stain is lifted. Contrary to what might feel natural, you want to start wiping or scrubbing the stain from the inside of the garment. If you wipe or scrub from the exterior of the garment, it might reinforce the stain and push it deeper. Scrubbing from the inside will literally help “lift” the stain more effectively. After the stain is removed, rinse or wash the cloth and run the garment through the washing machine with natural laundry detergent to complete the process. If, after treating the stain, a hint of the stain remains, wash in the washing machine with both natural laundry detergent and hydrogen peroxide. Store the spray in a cool, dry place. It will last about a week if made with regular tap water; and it can last up to a month if distilled water is used instead. If you don’t have many stains to treat on a regular basis, stick with small batches and use distilled water. 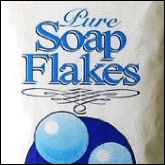 What’s your favorite natural laundry product?